Take your knowledge and programming to the next level as you discover the advanced features of grandMA2. 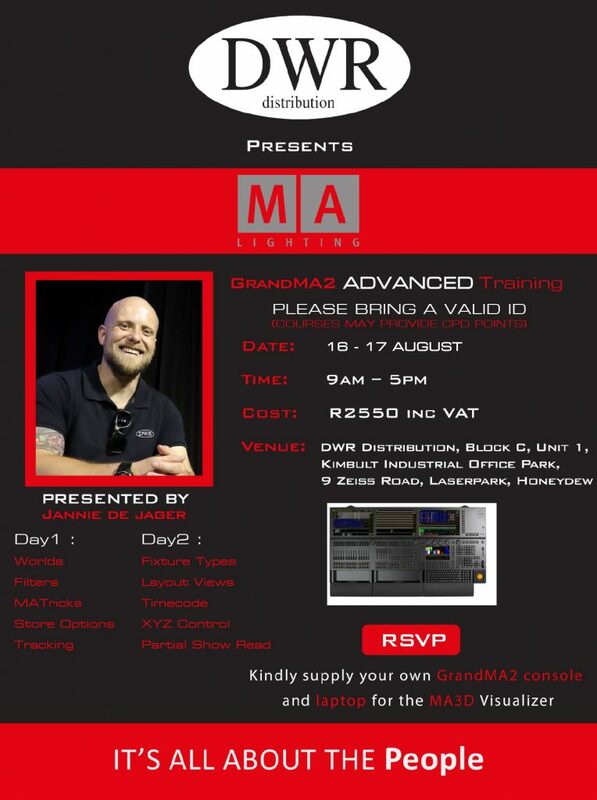 Presented by Jannie de Jager from DWR Distribution, the grandMA2 Advanced Training will be held on 16 & 17 August from 9am to 5pm in Johannesburg. Once training is complete, participants should be able to operate a grandMA2 to the level of being confident in programming and operating a mid to large scale production, using advanced techniques including building macros, timecode programming, advanced effects, XYZ programming, moving data between shows and building custom fixtures. Delegates are requested to kindly supply their own grandMA2 console and laptop for the MA 3D Visualiser. The cost is R2 550 per person and includes lunch and refreshments. Please let us know if you have any dietary requirements. The training will take place at DWR Distribution, Block C, Unit 1, Kimbult Industrial Park, 9 Zeiss Road, LaserPark, Honeydew.